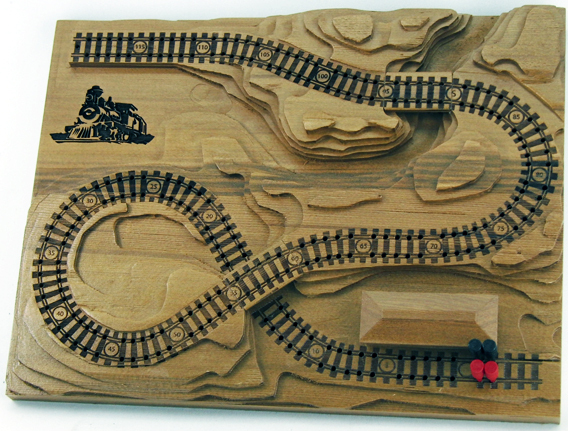 Cribscapes makes custom 3 dimensional railroads that happen to be a cribbage board as well. Well, I guess it all depends on how you look at it. 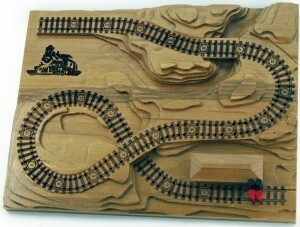 The boards make excellent gifts for the railroader who has everything or that you just don’t know what to get them. Cribscapes has personalized boards with Railroad Logos, and sentimental messages. Even corporate logos and provincial logos have been lasered for gifts of a more business nature. Some lasered logos are available for order on the website, but you can send in almost anything and Cribscapes will laser it on the board, or gift box, for you. One of the nice things about giving (or getting) a cribbage board as a corporate gift is that they tend to be kept around – and used. Cribscapes was very our first episode sponsor, has provided prizing on several occasions and continues to be a great supporter of the show. Please check them out! You can see the full selection of woods and styles, (They also make a golf board and a Lighthouse board), at http://www.cribscapes.com. Next Topic: Reviewing Railroads, Products, Books, Whatever! I would like to know where can i found t gauge starter set’s. There are others in Europe as well. Doc Christmas… Is This The Ultimate Story of Trains at Christmas? TrainTalk host, Neil Enock, is making a TV Show!